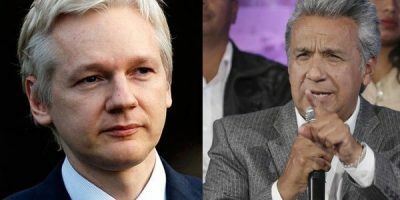 Ecuadorian President Lenin Moreno earlier said Julian Assange must eventually leave the country’s London embassy – at the time indicating it would be through dialogue. According to an Inter-American Court of Human Rights ruling, asylum granted to anyone is irrevocable under international law. Nations are obliged to uphold asylum rights, including the right of safe passage to the country granting it. Rule of law principles never stand in the way of US actions and aims. Assange’s asylum is gravely threatened, ongoing since August 2012. Extradition to America is virtually certain if it’s illegally revoked. A sealed indictment awaits him, revealed in mid-November. Obama declared him an enemy of the state. So did Trump regime hardliners – wanting him prosecuted for the crime of truth-telling, investigative journalism the way it’s supposed to be. Whistleblowing, other forms of dissent, and truth-telling on vital issues are the highest forms of patriotism. Washington criminalized speech, media, and academic freedom when exposing major wrongdoing it wants suppressed. Chelsea Manning, Assange and others like them deserve universal praise and support, including from world community leaders, international courts, and ordinary people everywhere. Illegally revoking Assange’s asylum ahead of arresting and extraditing him to America could happen any time. Mike Pompeo, John Bolton, and former AG Jeff Sessions’ claims about Assange greatly harming US national security were fabricated. “(W)e can no longer allow Assange and his colleagues the latitude to use free speech values against us” – a flagrant constitutional violation against anyone if enforced. WikiLeaks publishes material believed to be true, supplied by reliable sources, unidentified for their protection. It’s not an intelligence operation. Nor it it connected to Russia or any other country. All of the above is widely known – yet ignored by US hardliners and major media, failing to defend Assange’s fundamental rights under international and US constitutional law. Abad was involved in talks with Theresa May officials on resolving Assange’s situation, achieving nothing. One of his attorneys, Carlos Poveda, believes Ecuador and Britain may have agreed on a deal to extradite him to America. Another tweet called surrounding Assange with strangers “psychological torture,” removing people he trusts. Chelsea Manning was brutally tortured and otherwise abused from 2010 – 2017 in confinement. Wrongfully convicted in July 2013 for violations of the long ago outdated (1917) Espionage Act, Obama commuted her 35-year sentence before leaving office on January 18, 2017. Similar harsh treatment she endured for years awaits Assange if extradited to America – including virtually certain longterm imprisonment.